The Summary on the DVD: A tough U.S. Marshal helps a stubborn young woman track down her father's murderer. 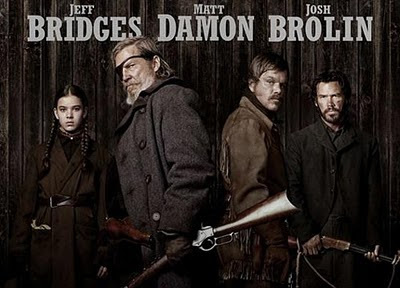 Main Stars: Jeff Bridges, Matt Damon- NOw these are names we know.. but the one that caught my attention and had me glued to the movie was Hailee Steinfeld. That little girl sure can act, and she has a voice and grit that stood out through the movie through Mattie Ross! Cogburn is an old, one eyed drunk, who does nothing but act as a Bounty hunter, killing scums, and making some money in the process. He takes on Mattie, promises to help her , and sticks by her side till the mission is accomplished. The morning after, she wakes up to find Cogburn gone.. Racing on her horse, she finds that she is refused passage on the ferry that took Cogburn and LaBoeuf across.. Determined, she crosses the river on her horse.. She then learns that the two men have agreed to split the Texas reward for Chaney. Accusing him of fraud, Mattie threatens to have Cogburn arrested for breaking their agreement. Cogburn reluctantly agrees to let her come along, but does nothing to make it a comfortable one. More than anything, the movie is about how Mattie goes against Cogburn's wishes to stay put in town while he goes on the search, and her determination every step of the way. The trio find themselves battling through heat, unfriendly goons, and nature where their grit is put to test. Infact, this is an adaptation of the movie that was made in 1969 starring John Wayne. Am curious to see the earlier version, to see how different it was!